Sugar, cocoa BUTTER, MILK, strawberry, glucose syrup (WHEAT / maize), thickener: E414, glazing agent: E904, vegetable fat, emulsifier: SOY lecithin, flavor. May contain traces of PEANUTS and NUTS. Fruits have no feelings, or this is what you'd think most of the time. But: you would never guess, what's hidden in those little white balls here. And why. At first, we weren't sure whether this is a good idea - now, we know it is perfect as it is, because, if you only knew, those Choco Yoghurt Strawberries would be muched down in no time. Apart from that, strawberries are shy. A fruity surprise! What's the use of freeze drying? Fruits are at their best when freshly served, preferably freshly picked. So far so true, but it's not possible to preserve fresh fruits as long as we want. So, we choose to freeze-dry them. That means, the strawberries are freezed before reducing the surrounding pressure to allow the moisture to evaporate. Thus, the taste, sweetnees and colour stay as we want them to. 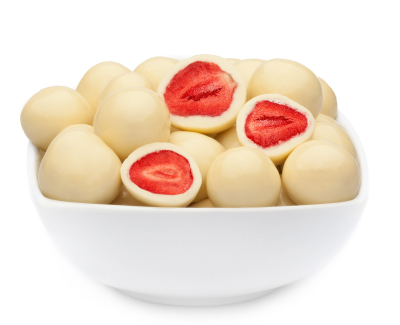 Those Choco Yoghurt Strawberries are best for those who want to contemplate their food thoroughly and attentively. Rightly so: take your time. Take several bites - nobody would be able to munch them down in one, anyway.